This reading bifocal was added to our website due to the popular demand of the Stylish Slim Bifocal Sunglass Reader which is the same frame with a tinted lens. Many people love the sunglass version of this style so we added it in a clear reading bifocal lens for indoor use. 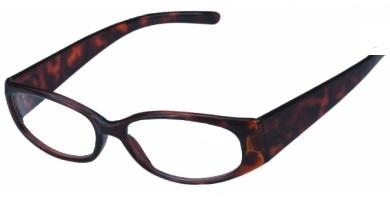 It is often difficult to find bifocal readers with stylish frames. You will love the style and functionality of this reader. This style is sold in a beautiful rich tortoise. Frame Front Measurements: 5 1/8" x 1 3/8"